3rd Sunday Lent Year B: Listen, Stop, SEE! and a link to the marriage covenant and relationship that God had promised with his chosen people. What strikes you about this image of ʻdancingʼ with the law? Are these ʻlawsʼ a burden? Or are they guidance directly from God that will lead to a full and joyful life? What ʻlawʼ grabs your attention the most. Why? Talk with God about that. • The word ʻcommandʼ literally means something ʻplaced in oneʼs handʼ. Like a letter from a close friend or special advice from a wise grandparent. Which bit of advice from the 10 commandments may I need to listen to and respect more in my life at the moment? • St Paul invites christians to be clear, it is not wisdom, special knowledge or worldly power that saves – it is the saving event of Jesus on the cross. Jews considered this full of ʻshameʼ. Greeks couldnʼt believe that God who is so powerful could actually ʻdoʼ this. What is your response to Jesus on the cross? • Jesusʼ first public action in the Gospel of John is to cleanse and purify the temple. It is a most dramatic action. Jesus replaces the temple and its sacrifices, its legalistic ritual, with his Body, his intimate presence. The Fathers house, a house of prayer, a place of communion and becoming one with God is now replaced by Jesus with his own body. Instead oflooking at a photo album of God, Jesus insists that God, He, is in front of their very eyes. Can you see what Jesus is doing in his first public act in the gospel of John? • The Gospel of John always has many layers of meaning and interpretation. Many began to believe as they ʻsaw the signsʼ he was doing. The cleansing of the temple takes place at the Feast of Passover. The next passover takes place in John 6 where Jesus replaces Mosesʼ bread (Manna) with his own body (Jn 6,35). The last passover takes places in John 19,31 where Jesus replaces the passover lamb with his body on the cross. Can you see the ʻsigns he was doingʼ and believe? • Has my image and experience of the Church changed over time? A Marketplace with all of its conflict? Legalistic ritual and laws? Intimate presence and communion with God in the celebration of the Eucharist? • Lent is an opportunity to practice three deep transforming experiences: Praying, Fasting, Giving. They can be re-framed as Listening (to God), Stopping (negative habits), Seeing (those in need and responding). 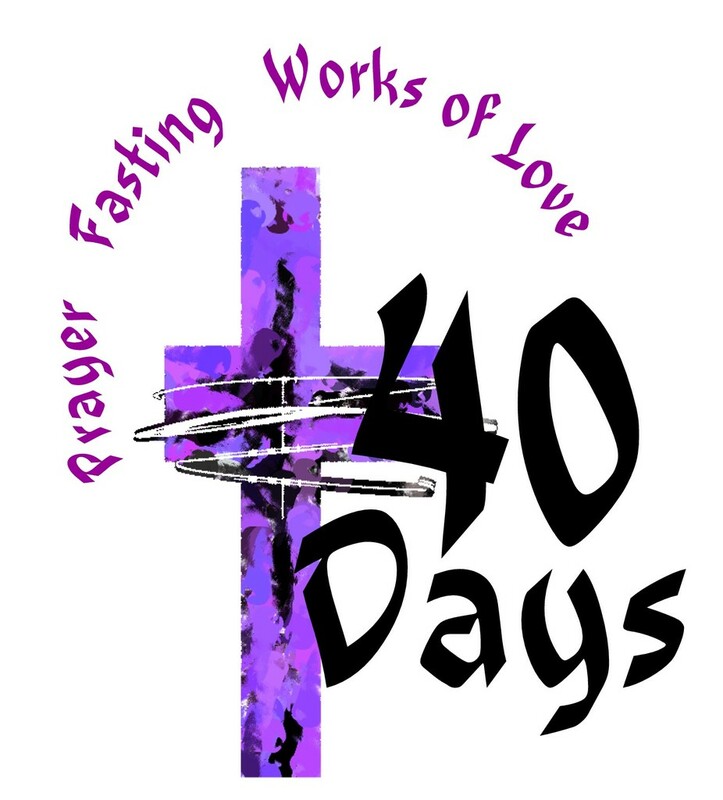 Which Lenten practice could you intensely focus upon this week? • At first glance, Abraham’s willingness to kill his son Isaac looks like murder. A deeper reflection leads us to recognise what is involved in offering a ‘sacrifice’. Abraham’s hope and future promise for many descendants is in Isaac. Abraham places his life and future in the hands of God. A ‘test’ for Abraham has found him ‘worthy’ and completely abandoned and obedient to whatever God will ask. Has God called you to do something? Have you delayed? Why does God invite followers to ‘give up’ things we hold so tightly? • Some scholars suggest that this special ‘high place’ where Abraham was to offer Isaac was the actual site of the 1st Temple of Solomon. High places were often on ‘mountains’ and were ‘meeting places with God’. Where is your ‘high place’ and what ‘offering’ or ‘sacrifice’ could you offer to God showing you yield to God’s will for your life in total trust? •St Paul encourages us to enter our imagination to feel how great God’s love must be. Have you ever had a friend or family show great generosity in buying or doing something for you? That ‘proof’ of their love allows you to deeply know they are ‘for’ you. If God did not spare his own Son, there is nothing more he could give to show the depth of his love. Does this give you confidence? To ask? To Love? God! Persecution and even death will be moments of persecutors merely bringing judgement upon themselves as against God, and will be a doorway for a disciple into heaven and victory. Do you overly spiritualize the phrase ʻdeny oneselfʼ? Is Lent about punishing the body or a transformed lifestyle and society confronting injustice? How much ʻcostʼ are you willing to endure? How could you ʻgive almsʼ to lift up those in need this Lent? • The presence of God – like a cloud covering the Mountain to speak face to face with Moses – speaks. We are not simply to gaze or adore, but LISTEN TO HIM. How could you more faithfully ʻlistenʼ to Jesus in prayer this Lent? What has worked? What has not worked? request, a cause. What or Who could you fast From or For? • How will you ‘livetheword’ this week? • What word, sentence or idea struck you from the readings? • What do you think God may be personally trying to say to you? my ʻsinʼ be teaching me? What do I need to do to move on? • Prayer – seeking to listen to God: try finding a time and place each day to be with God? • Fasting – seeking to be free of what is unnecessary: try giving up music in the car, internet, video games, some television, and fill it with a practice that helps you reflect on life? • Almsgiving – seeking to care for those in need: try focusing on a particular need you know about and giving either your time or money to a person or cause. Check with God how much! We only need to imagine the renewed and healed world if all were to make a commitment to these spiritual practices. What decision will you make to enter and live Lent deeply? 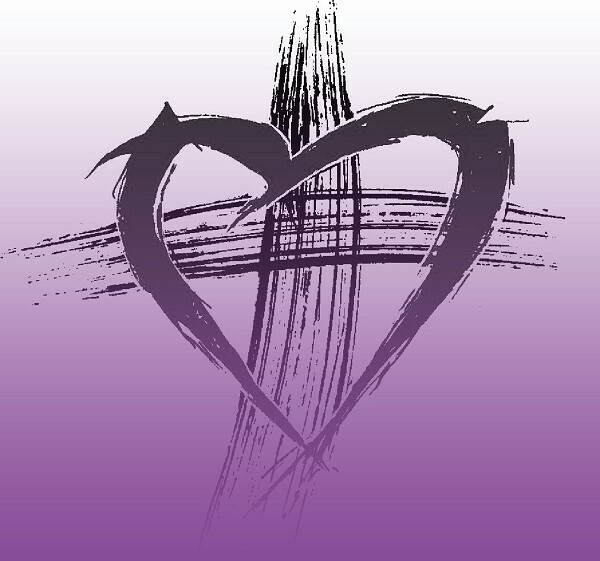 The journey of Lent began on Ash Wednesday. Have you recognised the significance of wearing a cross of ‘ashes’. Ashes symbolise a connection with the earth and being ‘humble’. The cross points to a life of sacrificial love with wide open arms embracing the world. What does living humbly mean for you? Is your life lived closed up tight, or with arms wide open? A goal without a plan is still a dream. Many people line up at the beginning of the lent ‘race’ but do not make much progress from the start line. What is your plan for Lent? Will this lead you into a ‘deep transformation’ or a mere ‘shallow show’? Genesis shares a truth about sin using a story. Have you ever noticed that the best the serpent can do is talk and try make people doubt God. “Did God really tell you…..” The serpent actually has no power other than suggestion. What voices and fears do you need to turn off this Lent? How will you listen to God? For St Paul Life and Death represent two different directions. Toward God (righteousness) and away from God (sin). Jesus has actually destroyed death by becoming human and offering his life in forgiveness. There is no more distance. Jesus rising from the dead reveals death actually has no power at all. Lent is an opportunity for intensive spiritual living toward what is life-giving. What relationships in your life are not right? Pray to the Holy Spirit to help you know what to bring to the sacrament of reconciliation this Lent. In the original greek, the word is ‘tested’ rather than ‘tempted’. A ‘test’ or trial can reveal what decisions and choices are made. We become aware if we are ‘ready’ for a challenge or responsibility to be given to us. Is being ‘led by the spirit into the desert’ of your heart positive or negative for you? Have you tried a daily practice of silence to listen to the voices of your heart? ‘Command these stones become loaves’. Fasting is a remedy for being controlled by food and satisfying our ‘body’. Our bodies are good but we are not to become slaves to every sensual pleasure. Rather than a focus on diet or weight loss, how could you ‘stop’ some activities to ‘start’ some more positive activities? ‘Throw yourself down’ is pretending that everything is ok and God will look after me no matter what I do. Am I responsible? You are where you are because you have chosen it. What do you need to take responsibility for this Lent? Abram has 3 conversations with God about a promise made to him. This is the second and Abram is upset. He has left his home, is in a foreign land, and the promise to be the Father of a large nation is almost laughable as he and his wife are now so old. They do not have a child. Abram asks for a sign. God makes a covenant. In the Old Testament a covenant was a solemn promise between two parties. Both parties would walk through the middle of the split animals as a symbol of what would happen if either party broke the promise. God is the only one to walk through the animals (v17) symbolized by the fire. What do you think this means? Can you identify with Abram in your life? What does God’s covenant faithfulness mean for you today? St Paul loved the Philippian community. They were his first community. They were being pressured politically. To be acceptable they needed to partake in civic ceremonies and the worship of the Emperor cult. They were worried about their image of acceptability. St Paul reminds them their citizenship is in heaven. What pressures do you face to be acceptable in the eyes of the world? How can you live more fully for ‘heaven’ during this time of Lent? The transfiguration of Jesus appearing dazzlingly white symbolises a heavenly reality. Jesus is indeed the Messiah. Fulfilling the law (Moses) and the prophets (Elijah). Jesus’ divine nature shines through. While glorious, the ministry in Galilee is now over. Jesus will soon ‘set his face like flint’ (Lk 9,51) towards the ‘exodus’, his suffering, death and resurrection in Jerusalem. Peter wants to stay in glory on the mountain. Is there anything you have heard in prayer that requires costly obedience? Where would the ‘journey down the mountain’ (from prayer) and confronting evil (to the cross) lead you? Making tents and sleeping in them was part of the Jewish Feast of Tabernacles. It reminded Jewish people of the special time when God pitched his tent among them in the desert. It was a symbol of wanting God to be with them again. Jesus is revealed as the very presence of God among his people in the transfigured bright whiteness like Moses had met on Mt Sinai. Peter doesn’t get it. He seeks to build tents hoping for a future coming of God. Peter does not know what he is saying or doing. Are you mucking around with ‘tents’ or going down the mountain to work? The ‘Divine Voice’ of the Father from heaven speaks only a few times in the Gospels. 9 words are shared today: ‘This is my chosen Son, listen to him’. During the season of Lent how could you ‘listen’ more? What is the best way you have found in the past to ‘listen’ to God? The book of Deuteronomy shares one of the most important statements of faith in the Old Testament. It was spoken every time a person gave their offering to the priest in the Temple. It reminded them of their identity and how God ‘saved’ them. Bringing the tithe (tenth) of the harvest to the temple acknowledged God’s care and provision. How could you express this religious practice of thankfulness – ‘tithing’ (giving a 10th)? Dt 26: 12-15 invites giving to the levite (priest), the foreigner (refugee), the orphan and the widow (those without family and financial support). This is at the heart of the Lenten practice of ‘almsgiving’. How generous will you be in giving of your time, talent, money, compassion… this Lent as a way of ‘thanksgiving’ for what God has given you? Paul’s letter to the Romans is a careful explanation of how we are made right with God. Justification by keeping the ‘law’ was deeply ingrained in Jewish consciousness and history. Paul reminds us that it is faith in God’s covenantal relationship with us in Jesus that saves us. In a relationship, what is the difference between ‘law’ and ‘love’? Do you ‘enjoy-love’ your relationship with God? Does a ‘love’ relationship need to respect any ‘law’? What word or image would describe your relationship with God ‘now’ as the journey of Lent begins? Jesus in the desert provides us with the starting point of Lent. Consider how you can create some ‘desert’ space in your life, away from distractions and noise, to be with God and discover your ‘true’ self? What is 1 decision you can make to enter the Lenten ‘desert’? Careful reflection on Jesus’ temptations leads us to see a mirror conflict within ourselves between good and evil. Get bread for ‘self’. Seek power and reputation. Demand support from others. Prayer, Fasting and Almsgiving are practices during Lent to deconstruct our false self and reconstruct our true self. Almsgiving enables the hungry at our door and beyond to be fed and healed. Fasting turns us from worldly consumerism to clarity of purpose and compassion for others. Prayer tunes us into God’s vision and voice. From Jesus’ temptations, which core temptation do you notice strongly at work in your life? Which Lenten practice do you need? Repent literally means ‘change your mind’. It could be understood as ‘turn your value system around completely – 180 degrees’. As Lent begins, Jesus guides us: there is more to life than satisifying our ‘bread-belly’ and physical or material cravings. What creative fasting experience could you create to nourish your spirit and soul journey? Returning from the great baptism event in the Jordan, Jesus would have faced pressure to get active and do things. Interestingly his choice was to listen to where the Holy Spirit deep inside was calling. Are you faced with a temptation to ‘perform’ and be a certain type of person in public? Whose voice is the Spirit and what is the Desert for you? “thoroughly wash me from my guilt and cleanse me from my sin.” (Ps 50) God does not want us to stay in sadness and guilt but to grow from our experiences in wisdom, in compassion…. what wisdom might my ʻsinʼ be teaching me? What do I need to do to move on? Now is a very acceptable time – Lent is a special time, but only works if we make it important. Is there any decision I have been putting off? Having I been waiting for the right ʻtimeʼ? What decisions could I make for Lent to grow in freedom, in forgiveness, in holiness…..? Prayer – seeking to listen to God: try finding a time and place each day to be with God? Fasting – seeking to be free of what is unnecessary: try giving up music in the car, internet, video games, some television, and fill it with a practice that helps you reflect on life? Almsgiving – seeking to care for those in need: try focusing on a particular need you know about and giving either your time or money to a person or cause. Check with God how much! We only need to imagine the renewed and healed world if all were to make a commitment to these spiritual practices. What decision will you make to enter and live Lent deeply? Ash Wednesday: Lent: a deep journey or shallow show? Ash Wednesday begins Lent. It is easy for 6 weeks of Lent to pass by and one has not placed oneself on the ‘starting line’ to begin the journey. Taking part in the reception of the ashes symbolises starting the journey. It is possible to appear at the starting line but not enter the race. What was the experience and journey of Lent last year like? Share a decision and plan with a faith-friend and ask for them to cheer you on over the next 40 days. The image from the prophet Joel is an invitation for everything to come to a complete stop. Call everyone. Old. Young. Babies. Newly married. Priests in the middle of their work at the altar. How could you ‘stop’? Where? When? The image is of a special people called to be a ‘light’ not a ‘reproach’ among the nations. Pray for the whole christian church throughout the world during the season of renewed faithfulness in turning from sin and being faithful to the Gospel. Imagine being an ‘Ambassador’. The responsibility and challenge of representing and delivering important communication. If you accepted the job your witness and life-style would be challenged to be in harmony with your message. Jesus gives his disciples an ambassadors task of proclaiming ‘on behalf of Christ, be reconciled to God’. Will you, as an ambassador, receive the sacrament of reconciliation during this season of Lent? Jesus does not ask, but presumes that a disciple will do certain actions. When you give alms…. When you pray…. When you fast…. These traditional lenten practices are powerful practices that help us to clearly focus on what is important. Prayer: What voices do you listen to? Fasting: What things fill your life?Almsgiving: Do you hear the cries of those in need and respond? Jesus emphasises doing these actions in ‘secret’ will be ‘repaid’ by God. ‘In secret’ guards us from seeking attention and personal ‘glory’ from others. Lent is not to turn into a shallow show. Do not be afraid to share your secret lent journey with a friend – and encourage your friend into the depths rather than the surface show. Jesus does not ask, but presumes that a disciple will do certain actions. When you give alms…. When you pray…. When you fast…. These traditional lenten practices are powerful practices that help us to clearly focus on what is important. Prayer: What voices do you listen to? Fasting: What things fill your life? Almsgiving: Do you hear the cries of those in need and respond? 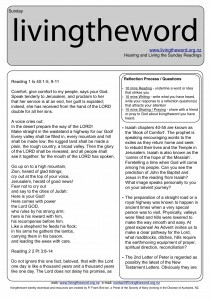 2nd Sunday Lent Yr B – Lent: denying ourselves sweets or confronting injustice? At first glance, Abraham’s willingness to kill his son Isaac looks like murder. A deeper reflection leads us to recognise what is involved in offering a ‘sacrifice’. Abraham’s hope and future promise for many descendants is in Isaac. Abraham places his life and future in the hands of God. A ‘test’ for Abraham has found him ‘worthy’ and completely abandoned and obedient to whatever God will ask. Has God called you to do something? Have you delayed? Why does God invite followers to ‘give up’ things we hold so tightly? Some scholars suggest that this special ‘high place’ where Abraham was to offer Isaac was the actual site of the 1st Temple of Solomon. High places were often on ‘mountains’ and were ‘meeting places with God’. Where is your ‘high place’ and what ‘offering’ or ‘sacrifice’ could you offer to God showing you yield to God’s will for your life in total trust? St Paul encourages us to enter our imagination to feel how great God’s love must be. Have you ever had a friend or family show great generosity in buying or doing something for you? That ‘proof’ of their love allows you to deeply know they are ‘for’ you. If God did not spare his own Son, there is nothing more he could give to show the depth of his love. Does this give you confidence? To ask? Love? The Transfiguration is in the middle of Mark’s gospel. It is time to go deeper. Jesus has just challenged disciples to be willing to ‘give up your life’(8,34-35) for his cause. They probably want ‘proof’ that it will be ‘worth it’. Jesus shows disciples his divinity (dazzling white as a sign of God’s presence) and authority (Moses and Elijah both spoke to God face to face on special mountains). He is truly the Son of God! Persecution and even death will be moments of persecutors merely bringing judgement upon themselves as against God, and will be a doorway for a disciple into heaven and victory. Do you overly spiritualize the phrase ‘deny oneself’? Is Lent about punishing the body or a transformed lifestyle and society confronting injustice? How much ‘cost’ are you willing to endure? How could you ‘give alms’ to lift up those in need this Lent? The presence of God – like a cloud covering the Mountain to speak face to face with Moses – speaks. We are not simply to gaze or adore, but LISTEN TO HIM. How could you more faithfully ‘listen’ to Jesus in prayer this Lent? What has worked? What has not worked? Fasting has often been a spiritual practice that intensifies within our bodies a focus, a need, a prayer, a request, a cause. What or Who could you fast From or For? How will you ‘livetheword’ this week?